We have reached the last of my looks from the new Wet n Wild Color Icon Eye Shadow Trios which are due to be released tomorrow (get your eagle eyes out!). Today I’ve got Dancing In The Clouds, which is another of my favorite ones. The colors in this one are more subtle and a little more sheer, but wound up looking really nice all combined I think. 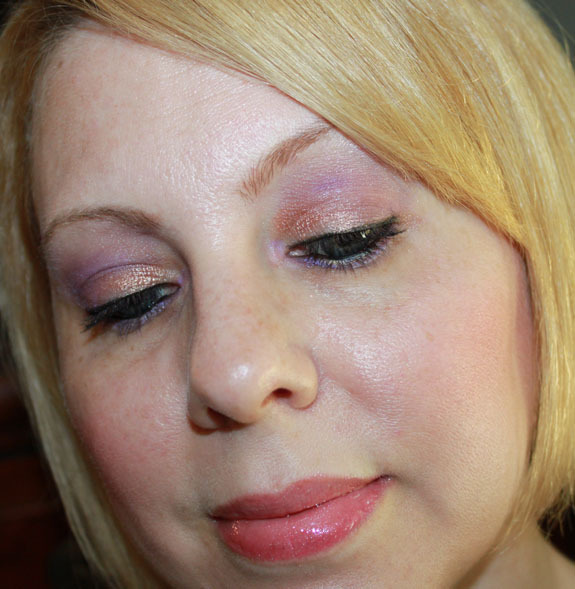 This time I did use all the colors according to where they say to place them, but I also added the crease color to the undereye area as well as inner corner area. 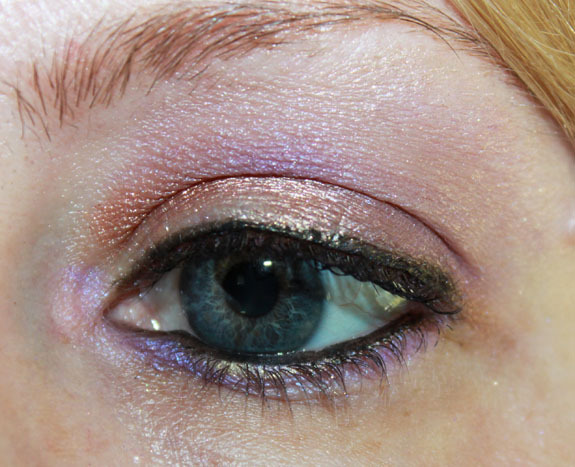 There is also just a little of the lid color under there to add some pink/gold with the purple. When I first started applying these colors they seemed so light it didn’t look like much was getting on there. But after I blended them in and worked them, I really loved the way it came out. 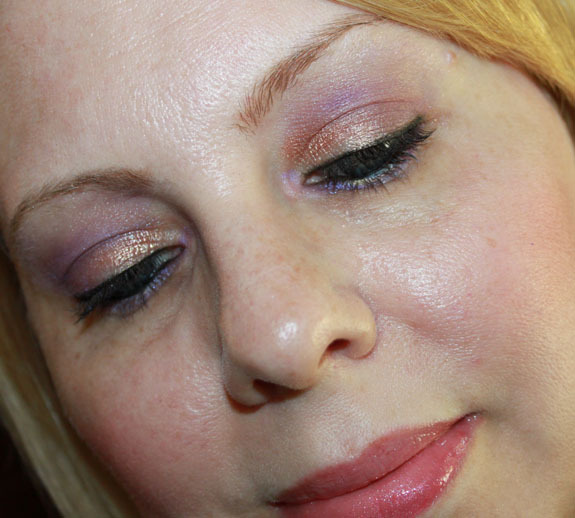 The pinky/gold and purple work really well together in creating a fun colorful look, yet also with some subtlety. ohh I love this look, it’s so soft looking! I need to try out something similar! I love the purple and the gold together. I never would have thought those two colors would work, but Wet n Wild knows better than I do! Glass Is In Session looks really nice on your lips, too. I really like the look. Reminds me of a sunset and makes your eye color pop. I think I’ll need to find this trio. 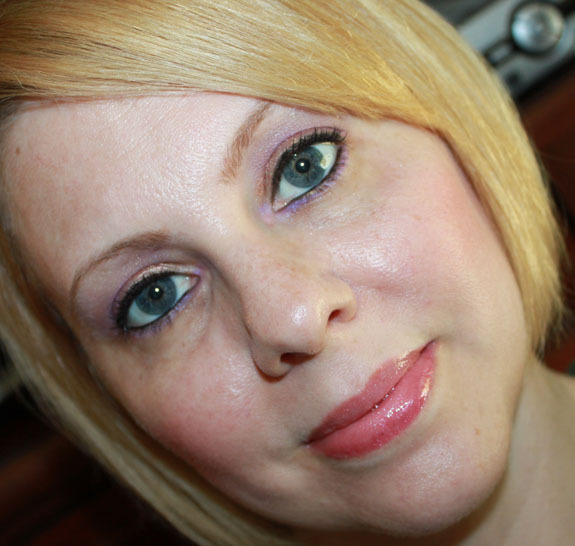 Very nice – love it with your eye color! I think of all the looks posted this week this one is my fave and mainly because it’s the type of colors I would use. 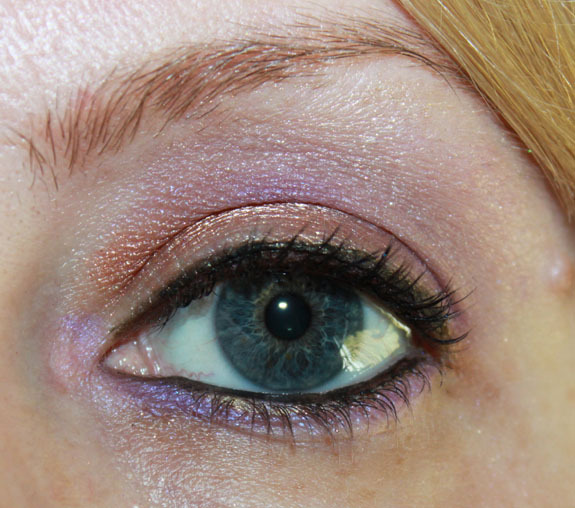 I like how you apply subtle eyeshadow colors and it looks great. Everyone doesn’t like to wear bright, bold colors. Very pretty!!! Looks like a sunset! For my tastes, the purple should have been more pigmented. But nice look after all. Very pretty. So soft & etheral.